The first issue of Hollywood Quarterly, in October 1945, marked the appearance of the most significant, successful, and regularly published journal of its kind in the United States. For its entire life, the Quarterly held to the leftist utopianism of its founders, several of whom would later be blacklisted. The journal attracted a collection of writers unmatched in North American film studies for the heterogeneity of their intellectual and practical concerns: from film, radio, and television industry workers to academics; from Sam Goldwyn, Edith Head, and Chuck Jones to Theodor Adorno and Siegfried Kracauer. For this volume, Eric Smoodin and Ann Martin have selected essays that reflect the astonishing eclecticism of the journal, with sections on animation, the avant-garde, and documentary to go along with a representative sampling of articles about feature-length narrative films. They have also included articles on radio and television, reflecting the contents of just about every issue of the journal and exemplifying the extraordinary moment in film and media studies that Hollywood Quarterly captured and helped to create. 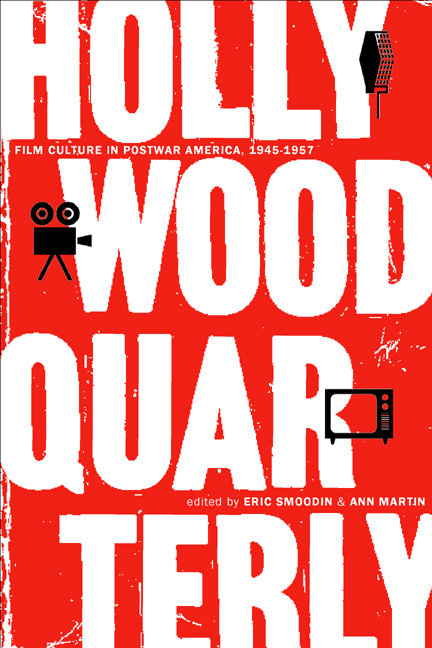 In 1951, Hollywood Quarterly was renamed the Quarterly of Film, Radio, and Television, and in 1958 it was replaced by Film Quarterly, which is still published by the University of California Press. During those first twelve years, the Quarterly maintained an intelligent, sophisticated, and critical interest in all the major entertainment media, not just film, and in issue after issue insisted on the importance of both aesthetic and sociological methodologies for studying popular culture, and on the political significance of the mass media. Eric Smoodin is Film, Media, and Philosophy Acquisitions Editor at the University of California Press. He is author of Animating Culture: Hollywood Cartoons from the Sound Era (1993) and editor of Disney Discourse: Producing the Magic Kingdom (1994). Ann Martin is Editor of Film Quarterly and Coeditor, with Brian Henderson, of Film Quarterly: Forty Years--A Selection (California, 1998).